Hailing from Stuttgart, Baden-Württemberg, Germany, A LONG WAY TO FALL was born. The band have been polishing their very own brand of modern Heavy Metal. The quintet features the talents of vocalist Bastian Fleischmann, guitarists Daniel Brück & Kevin Kübler, bassist , and drummer Thiemo Schnurr. April 2016 saw the release of their debut EP “HATESMOSPHERE” with Rockaine Music and have garnered positive feedback and manifested the signature sound of the band – emotional melodic Metal. Only a few months after their EP release, the band took the time to write their first full length album, “FACES,” which was released December 14th, 2018, via Rockaine Music/Rough Trade. I am not sure why this album hasn’t been listened to yet, but from the snippets I am ready to take a hard listen to, more than once is likely. “Choices” starts off with a bit electronica, but suddenly let’s go into a hard hitting double bass. The guitars come with down tuned heaviness. The song already has my head swaying with its rhythm but as the breakdown hits it is hard not to head-bang along. The vocals of Bastian Fleischmann come hard but let cleans stand out on their own. It is a very good start to this album. “Who Am I” is a track I had to listen to more than once. The slow heavy build up brings the song back up to speed. Again the song seems to throw emotions in the air effortlessly even as the breakdown hits. I am a bit surprised as the guitar solo finishes the song. It is a different element I am not use to hearing with this style. Normally it is just a breakdown with this music, but it is a good surprise. “Veloren” has a dark ambiance surrounding the song. The slow verse has dark side that allows the chorus to release more emotion than the previous tracks. The vocals are layered to an eerie level that encapsulates your brain as to even when the native tongue spills out, the translation is smooth. “Last Attempt” still holds this slow doomy overtone that reminds me of CHIMAIRA. Bastian Fleischmann’s calls of “What have I done again” trap me within the song. My head bangs to his voice and the addictive beat. “Stone Filled Heart” holds the band’s sound to the end of the album. The doubles and the power chords rip hard here. The mix of the clean vocals and screams are mixed and layered very well. The song still keeps your head bouncing through the song and once again, the breakdown hits even harder, only to let out to a slow and calm transition. I could only imagine seeing these guys live. I can see a crowd getting really pumped to this and enjoying every minute of the show. 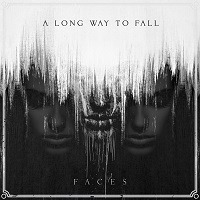 A LONG WAY TO FALL are a very talented band who bring a modern take on Metal with their music. Their sound may be influenced by AUGUST BURNS RED and PARKWAY DRIVE, but most elements have me relating their music to BLEED THE SKY and CHIMAIRA. The emotional lyrics and the headbanging music has the band on the edge of discovery by a larger audience.